Buy the biggest RV you can afford! You won’t be comfortable in anything under 40 feet! Buy your last RV first! There is a lot of advice on the internet regarding purchasing an RV. Go into any forum or Facebook group and ask people what they think and you are bound to hear many of the above statements. We sure did when we were looking for our first full-time rig. And they are repeated by many people in many different channels so that you start to take them as truths. But are they? Can these blanket statements apply to all RVers? Did they even apply to us? Our first RV. Isn’t it cute? When we started researching RVs for our full-time adventure, we were moving up from a pop-up camper to a motorhome. We went to RV shows, scoured RV forums and groups for info, and talked to everyone we could. Even though our little pop-up was a catalyst for our desire to live on the road, we thought we would need a little more space. After hearing people talk about the large spaces they needed, the smaller RVs we looked at started to close in on us. 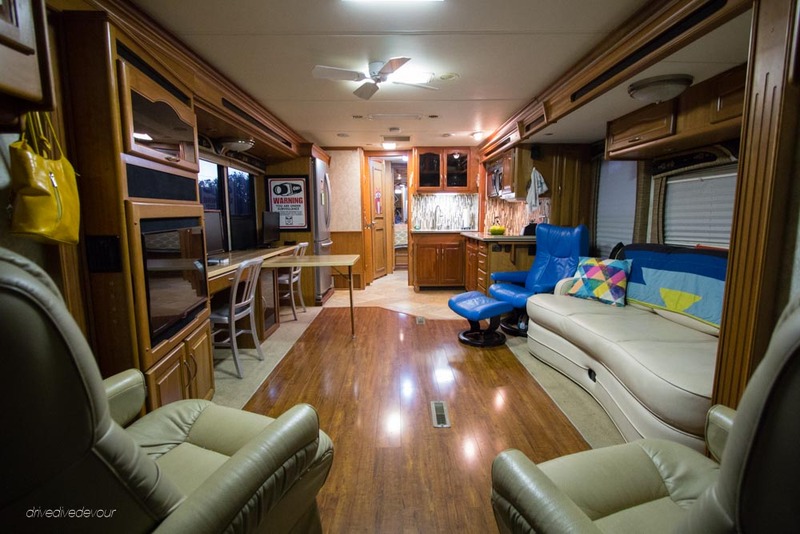 After all, in addition to the living and sleeping space most part-time and retired RVers need, we also wanted a dedicated work space. As we listened to everyone’s recommendations, we started looking a little bigger. And then even bigger until we ended up with a 40 ft diesel pusher with four slides. It had an ideal spot for our desk and all the storage space we needed for dive gear and other belongings. Our biggun: This Harvest Host was a bit tricky for us to make a clean getaway with such a big gal. At first, our new RV suited us just fine. We were in Texas and the South with full hook-ups and plenty of room for our beast. As time went on, though, we started to feel a little large and a little much. Don’t get me wrong, the space was great whenever we had friends over and the gathering inevitably ended up in our rig with our dual slides. But on a day-to-day basis, it was more than we needed. We talked a couple of times about trading it in, but always decided to stay with the devil we knew. Things came to a head in Colorado when there were parks for which we were too big and boondocking spots we couldn’t reach in the RV. We already traded our Mini for an Xterra at the beginning of our Colorado stay and used it explore places we could never go before. It made us yearn for more possibilities with the RV. We spent the whole summer in the state finding places we’d like to go, but couldn’t. Our last stop in Durango had us in a KOA (actually, the best one we’ve ever visited) while our friends were all wild camping just outside of town in their smaller RVs. That was it; we needed a smaller rig. Our first RV went on forever! On our second RV shopping experience, what advice did we take? Well, mainly our own. We knew the size we wanted (28-33 feet) and what would make us comfortable. We had been on the road for almost two years and knew what worked for us in terms of size and layout. We did ask our friends about their experiences and tried to learn from them. Many of them had been to Alaska that summer in gas motorhomes giving us the confidence that a gas RV would work for us, too. So we ended up with a 30 ft gasser with two small slides. Did we have to give up more stuff to fit in it? Yes. Did we need any of it? No. People ask if we feel really tight now with 10 fewer feet, but it’s just the opposite. The RV feels roomy and luxurious inside, dare I say, almost too big? We feel lighter and more nimble. We can get into spots in smaller state parks and feel more comfortable boondocking. We added solar because we were more confident in this rig and how it fit our needs than our previous one allowing us even more freedom. It fits us. Can Common RV Buying Advice Work? What about that advice? Should you buy the biggest 40 ft and above diesel pusher that you can? Maybe, if that makes sense for your style of living. Perhaps you want the bigger space because you plan to stay still for months at a time or will be a snowbird. But do you really know how you will live? We didn’t. It took us getting out there and living on the road and experiencing different styles to find our way and we’re not the only ones. We know others who have found their first RV to be the wrong fit. One family we met decided that a smaller travel trailer was better for them than the 5th wheel they initially purchased. Our friends Josh and Marie also gave up their 5th wheel and chose a motorhome instead (actually a model we had seriously considered). I’d like to say Airstreamers tend to stick with their purchase, but our Snowmad friends traded theirs for a small motorhome and recently decided to go even smaller with a van style. Others we know do have their first RV, but readily admit they would be happier in something smaller or a different style. 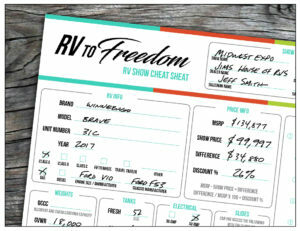 So can you really buy your last RV first? I’d say only if you’re really lucky or stubborn. 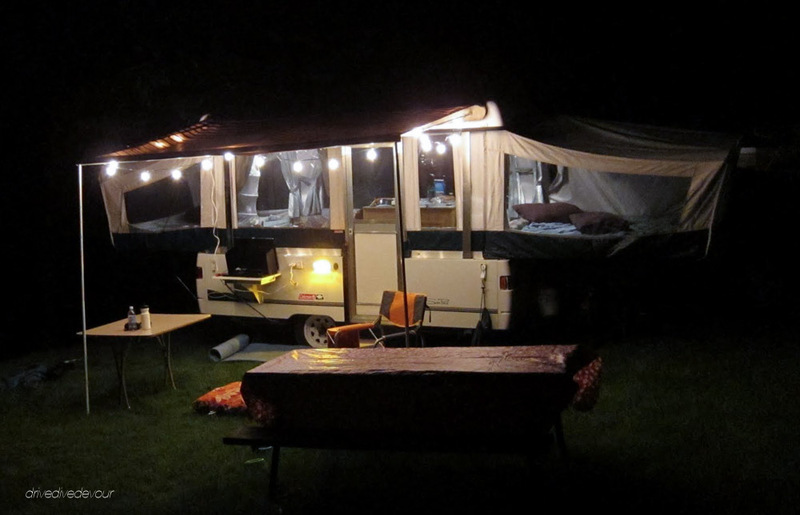 If you’re experienced enough to know what you want, you’ve probably been RVing before. And if you bought one and have found it’s not quite the right fit, maybe you’re stubborn enough to make it work for whatever reason. You’re a lucky soul who found the perfect RV on the first try and I know there are a few of you. 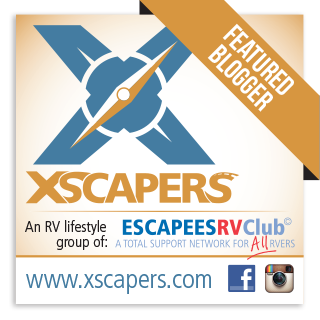 What’s our advice to prospective RV buyers? Do your homework and look at all the ways people camp to see where you might fall. 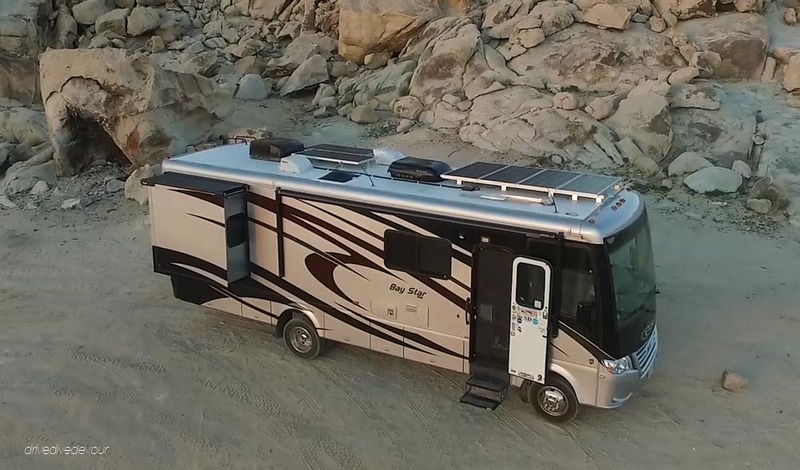 Find an RV in your budget, preferably in the low-end, so you can get out there and experience it for yourself. If you can get into it cheaply and soon find you would prefer something different, it will be less painful to change later. We all don’t need the biggest, baddest RV on the planet. We need the RV that is the best for us. Now we feel more comfortable getting to places like this! That road isn’t as smooth as it looks. What an encouraging read! We’ve been very happy with a smallish 5th-wheel trailer as we just use it for vacations so far. However, we’re certainly looking at larger units for after retirement. We’d been thinking that, like you, we would probably prefer a motorhome in the 30 ft. range. Is it just my imagination, or are there more smaller motorhomes available now than there used to be? Thanks, Cathy! I’m so glad you found it helpful. And you’re right, there are more smaller motorhomes around. Manufacturers used make smaller ones and when the economy turned, ironically, a lot of smaller options were killed. That’s changing, though, even on the diesel side. Nicely put! We were lucky enough to have had “vacation” RVs prior to purchasing our full-time home and that experience helped us find a perfect fit (29′ gas Class A). I think your advice to get a lower end starter rig is spot on. Great advice, great perspective. Thanks, Jeanette! I wish we had red this before we purchased our first motorhome. You guys definitely got a good one! I love this advice, Kerensa, and agree wholeheartedly. Thanks, Brittany.I know you found one a little larger than you were initially thinking, too. But you have definitely made it your home. Such a good read……except now we are more confused than before this blog! We are going to sell our family home this year and plan on moving into a diesel coach full-time. Are you recommending gas over diesel? I do hope to spend more time boon-docking than not, are the 40’+ coaches really too big for many spots or is it more of a maneuverability issue? Thanks for your help! Thank you so much! I have been following Nikki & Jason Wynn for a few years and will go back and re-read that gas/diesel post. I am so glad the full-time community keeps in touch with me as I prepare to start my big journey! Over the past 35 years we’ve had 2 class B van campers. When there was just 2 of us, and we both worked full time, going out a few weekends a year, that was a perfect size. We spent the night in a campground, the day time driving to visit family or sightseeing. The van was perfect for driving & parking! But, I got tired of sleeping on a fold out couch, and I didn’t like having to create a bed every evening no matter how late we had been out, and I didn’t like having to fold up the sleeping bags and bed before we could stand up & get dressed in the morning. We did a lot of reading, research, rv shows, and decided that we still wanted a vehicle that was easy to drive, easy to park, no towing! But we also wanted a queen size bed permanently set up, and a full bathroom. We purchased a 24 ft Class C, no slides. We have plenty of room to move around. We have more storage under the vehicle than total space in the van. We are “happy campers”! That’s great, Jane! Currently, I’m with you on the permanent bed. I like the idea of being even smaller and street camping, etc., but I like having a separate bedroom. When each of us became sick this winter (the first time on the road), it was so nice to have a bedroom set-up where we could hide while the other one carried on with their day. We started with a 38 ft, one slide , gas MH and liked it so much that we bought a newer model of the same coach. We then went to a 37 ft 5th wheel with 3 slides. Didn’t want to take it to Alaska so we bought a used Lance slide-in camper and put it on our one ton dually for that trip. We loved the smaller, go any where utility of this set up so much that we knew our next unit would be a smaller MH. We currently have a 28 ft gas Safari Trek for traveling, kept the 5th wheel (Big Horn) for set-up on an ERPU lot and sold the truck. I miss the power of the diesel. After 14 years of full-timing I think I am happiest with this set-up because I can get in places that the big rigs can only dream about. That’s awesome! You’ve really run the gamut. I’m glad you found the set-up that works the best for you. Kerensa- we highly recommend the inexpensive used RV for #1…the learners RV. You will learn your likes & dislikes and how you will actually camp. Then spend a bit more on #2. We bought our first 21′ TT for $14,500 USED. After 2 years we learned that we preferred boondocking and wanted something more 4 season and Solar. We sold our TT after 2 yrs for what we paid for it and bought a shorter (32′) fifth wheel USED. After a year we’ve learned that the length is good but our height is an issue for more wooded camping (we are on antenna #3). For now we are content with what we have but are confident we will eventually be in an airstream down the road. I think when you are a serious RVer there is no “last” RV. Just the “next” one. Your recommendation is spot on in my opinion. 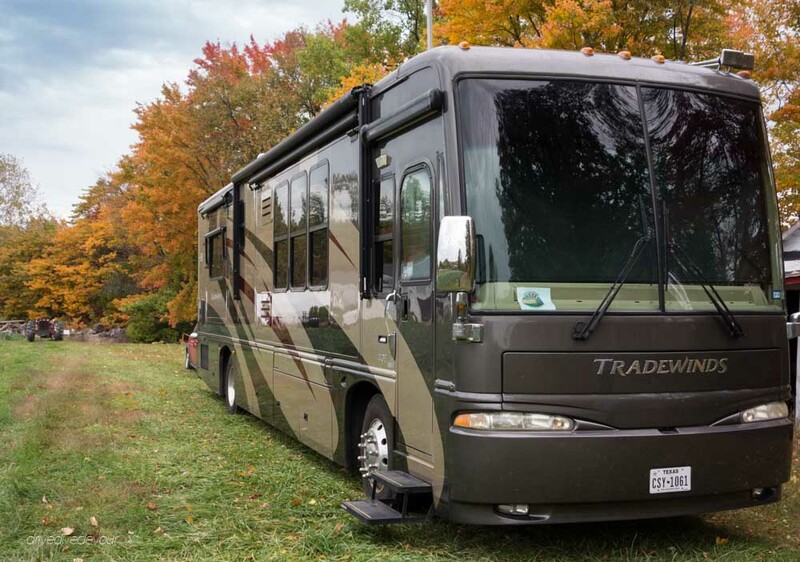 Last summer (2015), we purchased our first Class A diesel pusher, 38′ with 3 slides, a 2005 with 32k miles. We have only had her out 8 times, but we love it so far. The problem is, we are not allowed into some RV “resorts”, b/c she is over 10 years old. She looks good, so I don’t understand this. We have camped in a tent and in 2 different trailers years ago. 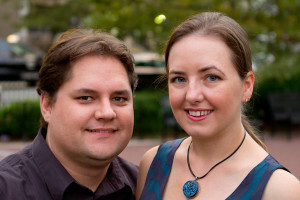 We would like to learn to boondock, especially after we retire, in order to save money. We are hoping to figure this out. Any suggestions on if we can make this work with our rig? That can be a frustrating rule and we’ve heard some parks enforce it more than others. I always laugh when our airstream friends get rejected because I can never tell what year they are. Boondocking is definitely possible in a larger rig. You just might not be going into the woods on twisty roads like smaller trailers. We still have issues with our height and trees for instance. But there is a log of land out west that will suit you just fine. I’m putting a couple of links here. The first is about our solar set-up which has been great for our boondocking adventures. The second is to Wheeling It’s boondocking tips. Their “beast” is longer than yours, but they boondock all the time. After two years of research, listening to podcasts of Living the RV Dream, Listening to Technomadia, reading Nick Russell’s the Gypsy Journal, and finally spending the last two months on the road full timing. I’m glad I did not purchase the 40ft, 5th-wheel toy hauler, 30ft, Travel trailer. I simply returned to VA took the old family pop-up out of storage and spent the past three months acclimating myself to the full-time RV lifestyle. It is during this time; I’m quite sure that either a 22ft Airstream or Fiber Glass RV will suit me just fine. Your article and site I will recommend to many of my baby boomer friends who are considering the nomadic lifestyle. I will also pass on to some of my online magazines I write articles for a couple of online magazines. There is an opportunity for you to reach a wider audience. Thanks for recommending our article. We probably should have done what you did. We didn’t really know what type of Rv’ers we would become. Now we are pretty happy with our RV. Of course we have our eyes on the future and see something even smaller and more nimble next. We are in full blown research mode right now as we plan to transition to full time RV life in Summer 2017. We are totally confused as to what to go for! We got to do a test drive in a class A this week with no slides. For our family of 4 and 4 dogs.. this wasn’t big enough for us. However anything bigger than that is probably cost prohibitive, so we may have to go for a travel trailer or 5th wheel. Keep looking and you will find something. Keep in mind that people are pretty adaptable. We have seen families of 5 live in a truck camper and some of our friends with 3 large dogs lived in a very small class A. They may feel tight now compared to a house but you will get used to them. If you plan to move often then smaller is better. Travel trailers can work nicely. At first it doesn’t seem like they have enough cargo space, but you can use the back of you truck or van as additional cargo space. Also you can pull a Travel Trailer with some vans and then outfit the back for sleeping. If some of your kids are old enough they can sleep there if needed. You can even get a tent for the kids to sleep outside too. Fifth wheels are nice if you want a big residential feel just make sure you don’t skimp on the truck and get one that is big enough to pull it safely. That is what we started looking at first. After we added the cost of the truck and fifth wheel together it was basically the same price as a class A for us. Good luck and keep hunting.